Turkey’s central bank has cut its end-2019 consumer price index (CPI) inflation forecast to 14.6%. The outlook, given in the national lender’s first inflation report for 2019, moves the estimate down from the 15.2% predicted in last October’s inflation report, central bank governor Murat Cetinkaya said on January 30 at a press briefing. In the first inflation report of 2018 released in January last year, the central bank forecast that at end-2018 inflation would stand at 7.9%. In the second inflation report released three months later in April of last year, the end-2018 inflation forecast was raised to 8.4%. In the third inflation report of last year, released in July, the forecast was hiked to 13.4%. And in the fourth and final inflation report, released in October, the forecast was taken all the way up to 23.5%. “Inflation remained below previous forecasts and market expectations as of end-2018,” according to Cetinkaya’s press briefing. Giving further details of its latest inflation forecast, the central bank said there was a 70% probability that inflation would be between 11.9% and 17.3% (with a mid-point of 14.6%) at end-2019. The regulator kept its food inflation estimate for 2019 at 13% while its average oil price estimate was revised down to $63.1 per barrel from the $80 anticipated in the October report. “#Turkey's supermarkets are so scared of being blamed for the high inflation in the country, they stop selling green peppers & eggplants and other expensive veggies altogether,” Fercan Yalinkilic of Bloomberg said on Twitter, citing a Bloomberg report entitled “Erdogan Hunt for Treason in Price Hikes Depletes Veggie Shelves”. Shamed by President Recep Tayyip Erdogan for failing to keep prices lower, some supermarkets have indeed stopped selling some ingredients widely used in Turkish cuisine, local daily Hurriyet reported on January 29, adding that the wholesale prices of the items had rocketed. According to a regular report on “people’s inflation” released on January 29 by Birlesik Kamu-Is, a confederation of public workers’ unions, food prices rose by 14.75% m/m and 55.3% y/y in January. Tornadoes and heavy rain last week in the southern province of Antalya, an important region for greenhouse farming, drove up prices of fresh fruit and vegetables, Muammer Komurcuoglu of Is Investment told Reuters, adding: "We will see the partial impact of the flood in Antalya on prices in January. The remaining impact of the price increase stemming from Antalya will be felt in February." Vegetable prices rose by between 65% and 150% due to the unfavourable weather conditions in Antalya, local business daily Dunya reported. Erdogan’s close ally, Venezuelan President Nicholas Maduro, also has his problems with supermarkets. “We had a group of supermarkets that hid the products from people and started to charge them whatever they wanted. There are 34 managers of big supermarkets behind bars for violating the law,” Maduro said in September. The Turkish central bank, meanwhile, contends that inflation will fall to 8.2% in 2020 before stabilising around the official target of 5% in the medium-term. “Today’s report shows that the central bank will avoid premature easing given the reiterated policy guidance with a promise to further deliver monetary tightening if needed,” Muhammet Mercan of ING Bank remarked in a research note. According to the latest Reuters poll, there is an expectation that Turkey’s policy rate will be cut to 19.75% at end-2019 from the current 24%. “Turkey has the highest nominal interest rates in the emerging world, however, we think falling inflation, the recent strength of the lira and political pressure will prompt the CBRT to cut rates sooner rather than later,” Capital Economics said on January 25 in a research report. On governor Cetinkaya’s pledge to keep a tight monetary policy stance, the TRY gained 0.87% d/d against the USD to trade at 5.2683 as of around 15:00 local time. Three-month implied volatility for the lira slid to its lowest level in about half a year after the central bank’s statements, Reuters reported. Turkey’s 10-year benchmark domestic bonds fell by 28bp to below 15%, Bloomberg reported on January 30. “Markets appreciating the CBRT's return to orthodoxy. In my mind, growth, inflation and the current account deficit will all surprise on the downside this year,” Tim Ash of BlueBay Asset Management said in a note to investors, commenting on the falling bond prices. “Crucially, we doubt that there has been a fundamental shift back to orthodox policymaking at the central bank and, as such, Turkey’s longstanding inflation problem is likely to be left unchecked. As a result, inflation and interest rates will remain higher than they were prior to the lira crisis,” Capital Economics said on January 29 in its Emerging Europe Economic Outlook report, adding: “In order to prevent the real exchange rate from appreciating and to maintain Turkey’s external competitiveness, the lira will need to fall further—we expect it to end this year at 6.25/$ and to end 2020 at 7.00/$. The consensus expects a more gradual decline in the currency to 6.50/$ by end-2020”. “The Treasury has been signalling a different domestic borrowing strategy since November. If the cash accounts are strong, the Treasury cancels some of the auctions previously scheduled or taps the markets at much lower amounts than projected. In addition, diversification of the instruments is prioritised with FX-based debt instruments making up the agenda currently,” Ozlem Bayraktar Goksen of Tacirler Invest said on January 28 in a 2019 economic outlook report for Turkey. “Turkey’s recent troubles illustrate how government pressure to keep interest rates artificially low can lead to inflation and balance of payment problems,” Neil Shearing of Capital Economics said on January 21 in a commentary entitled “In defence of central banks”. Shearing refers to policy rates in his commentary; however, the Turkish government has also been warned as to how maintaining artificially low domestic bond rates could end badly. The Borsa Istanbul’s benchmark BIST-100 index continued with its rebound on January 30. The index was up 0.34% d/d to 104,455. It was in the doldrums in the 87,000s as recently as January 3. “Market sentiment has turned more constructive on EM amid anecdotes of a healthy rebound in emerging market flows… Our trackers do not point to a convincing pick-up in flows beyond China with flows to key emerging markets like India and South Africa quite weak, even after sizeable and persistent outflows during last year’s EM sell-off,” International Institute of Finance (IIF) said on January 24 in a research note entitled “How Big is the Rebound in Flows to EM?”. Meanwhile, Turkish statistics institute TUIK has again been “revising” its data series. Turkey’s economic confidence index fell by 4.2% m/m to 78.5 in January from 81.9 in December, TUIK said on January 30. But TUIK said on December 28 that the index rose by 2% m/m to 75.2 in December. 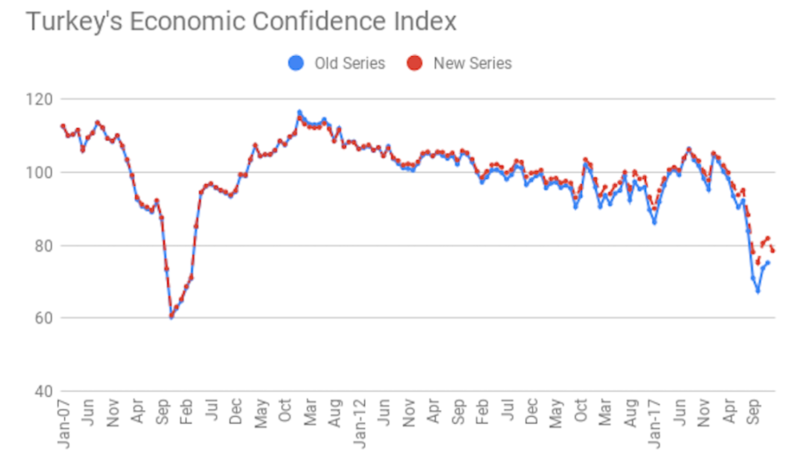 “Consumer confidence index has been published as seasonally adjusted since January 2019. Accordingly, adjusted sub-indices have been also used in economic confidence index calculations,” TUIK said, explaining the jump in confidence. “Further evidence of extent of slowdown/recession and deflationary conditions,” Ash said, commenting on the economic confidence index in a separate note to investors. “Private sector credit ratios have risen sharply in Turkey and, to a lesser extent, Chile, Malaysia and Peru. Among these, the risks are greatest in Turkey, where a greater proportion of lending was made in foreign currencies, the lira has fallen sharply and the economy is now in a deep recession. Banks so far don’t seem to be suffering acute strains, but rising bad loans and deleveraging will hamper the recovery,” William Jackson of Capital Economics said on January 25 in a research note.